IMHOTEP players celebrate after winning the Bonner-Prendergast vs. IMHOTEP H.S.PIAA Class 4A boys basketball championship at the Giant Center in Hershey, Pa. on March 21, 2019. 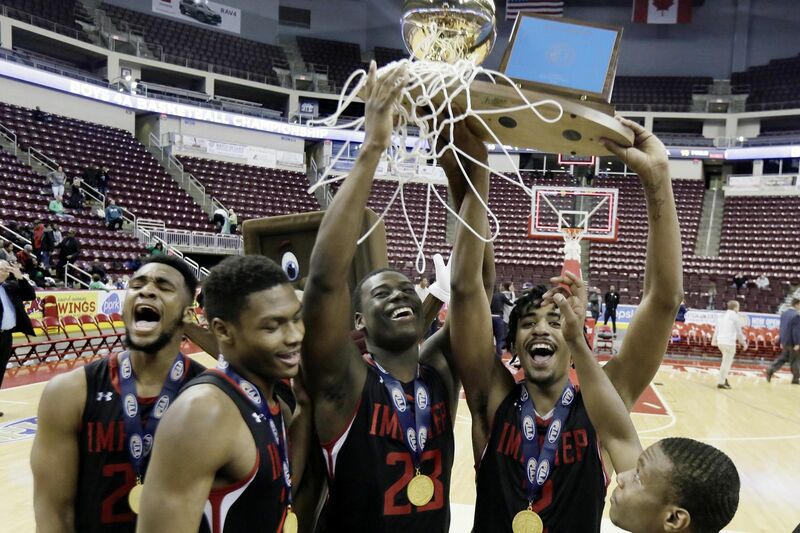 HERSHEY, Pa -- As has become a custom in its run of consecutive PIAA championships, Imhotep’s greatness Thursday night at the Giant Center began on the defensive end. The Panthers used length, cunning, and quickness to slowly constrict Bonner-Prendergast, 67-56, capturing a third consecutive PIAA Class 4A title. Senior University of Maryland recruit Donta Scott led the Panthers with 20 points. The 6-foot-7 forward also added six rebounds and five assists. Junior forward Elijah Taylor came off the bench to add 16 points (7-of-7 from the field) and five rebounds. The Friars were led by senior University of Miami recruit Isaiah Wong, who finished with 29 points (7-of-18 shooting) and eight rebounds. Junior guard Donovan Rodriguez added 14. The Friars (22-6), however, got little offense elsewhere. Foul trouble, along with 5-of-14 shooting from those not named Wong or Rodriguez, hurt their chances. Bonner-Prendie, which had beaten Imhotep, 59-57, in overtime back on March 1 for the District 12 Class 4A title, shot just 17 of 45 overall (37 percent) and turned the ball over 14 times. With the Panthers’ length and quickness around the perimeter, Imhotep forced the Friars’ offense to begin its attack farther from basket. Wong, the back-to-back Catholic League MVP, even drilled leaning three-pointers from nearly 30 feet in the third quarter. In stark contrast, the Panthers (25-6) finished 23 of 40 from the field (57 percent). Imhotep also led, 27-23, at the half and, 48-37, entering the fourth quarter. The game, a disjointed contest complete with whistles, contained 41 combined fouls. IMHOTEP Chereef Knox holds up 3 fingers after winning the Bonner-Prendergast vs. IMHOTEP H.S.PIAA Class 4A boys basketball championship at the Giant Center in Hershey, Pa. on March 21, 2019. Tariq Ingraham, a 6-9 senior for the Friars, logged just seven minutes in the first half due to two early fouls. He finished 0-for-1 from the field with three rebounds, zero points and four fouls. Imhotep, which won its eighth Public League championship earlier this season, also had late foul troubles. The Panthers, however, turned defense into offense late, never relinquishing the lead in the second half. Imhotep had won its last two PIAA Class 4A championships, beating District 10′s Sharon, 71-35, last season and Strong Vincent, 80-52, last season. B-P: Isaiah Wong 29, Tyreese Watson 3, Michael Perretta 5, Malik Edwards 3, Donovan Rodriguez 14 AJ Burnett 2. IMHOTEP players and coaches celebrate after winning the Bonner-Prendergast vs. IMHOTEP H.S.PIAA Class 4A boys basketball championship at the Giant Center in Hershey, Pa. on March 21, 2019.